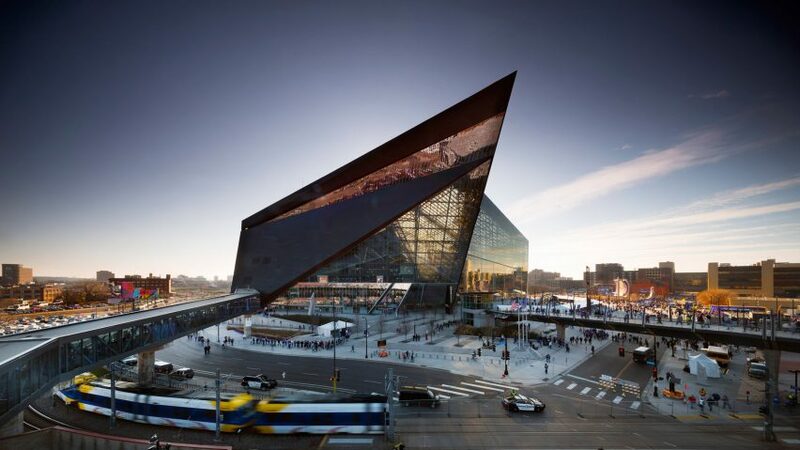 America's most popular sporting event, the Super Bowl, will take place next week at a new stadium in Minneapolis, featuring angular protrusions, zinc cladding and a roof partly made of plastic film. Located in downtown Minneapolis, the US Bank Stadium is home to the Minnesota Vikings, a member of the National Football League (NFL). Encompassing 1.8 million square feet (167,225 square metres), the building also serves as a venue for events such as concerts, conventions and high school and college athletic games. On 2 February, the 66,200-seat stadium will host the 52nd Super Bowl, the most important American football game of the year. The Philadelphia Eagles will play the New England Patriots at the venue, in a match predicted to be the country's most-watched sporting event. The building occupies a prominent urban site totalling 38 acres (15 hectares). Wrapped in a faceted envelope, the steel-frame building has a sculptural form influenced by the region's Scandinavian heritage and natural topography. "HKS designed the building to reflect the culture, climate and context of its city, drawing inspiration from ice formations on nearby St Anthony's Falls, as well as Scandinavian design such as Viking longboats," said the US-based firm, which has offices around the globe. The exterior walls consists of dark zinc panelling set against vast sheets of glass. An angular protrusion on the western elevation has invoked references to the prow of Viking ships. One of the building's prominent features is The Legacy Gate, which consists of five pivoting glass doors that range in height from 75 to 95 feet (22 to 29 metres). When opened, the gate connects the stadium to an adjacent plaza. The building is topped with a sloped roof, part of which is made of ethylene tetrafluoroethylene (ETFE), the same type of plastic used for the new US embassy in London by Kieran Timberlake and for the Eden Project in the UK, designed by Grimshaw Architects. It is the first major stadium in America to have an ETFE roof. "ETFE, a lightweight and transparent material, comprises the entire southern facet of the roof line," the architects said. "The translucent ETFE roof withstands the brutal weather of Minneapolis' climate, while flooding the interior with natural daylight, creating the feeling of being outdoors without subjecting players or fans to the elements." HKS initially considered a retractable roof for the stadium, but the cost was too high, particularly given that usage would be limited due to the high amounts of snow and ice in Minneapolis during the NFL season – which runs from September to the first week in February. While conceiving the shape of the roof, the team looked to Nordic architecture for ideas. "The­­­­­­­­­­­­­­­­­­­­­­­­­­­­­­­­­­­­­ first objective in designing the form of the building was to get snow off the roof of the stadium as quickly and simply as possible," the team said. "To reduce structural loads and minimise building costs, we analysed traditional Nordic architecture, determining that a sloped roof would offer both cultural and structural precedent to the challenge of building in Minneapolis' snowy climate." The sloped roof also forms a "lofted interior heat reservoir", which stores heat generated by the sun and helps melt snow on the rooftop. The building also contains a system of vertical air risers that distribute the warm air to the seating bowl below. In total, the stadium has seven levels, which includes two concourses with 360-degree circulation. The playing field is encircled by seating that begins just 41 feet (12 metres) from the sidelines. The stadium boasts 131 suites, nearly two dozen of which are situated on the field. Six clubs are available for private events, such as corporate meetings and weddings. "One of the stadium's clubs – Mystic Lake's Club Purple – offers two unique features targeting millennial audiences," the architects said. "The first is an exterior rooftop area with sweeping views of the Minneapolis skyline, and the second is a seating area in the stadium bowl with the look and feel of a rooftop bar, replete with couches and table service." The building has a number of sustainable features, which enabled it to earn LEED Gold certification from the US Green Building Council. In addition to natural illumination provided by glass walls and the plastic roof, the team incorporated LED sports lighting, which significantly reduces energy consumption. "LED lighting – the first of its kind in a new NFL stadium – can adjust colour temperatures and turn off and on quickly to allow for unique pregame and halftime entertainment and an enhanced viewing experience," the architects said. Spectators are encouraged to use public transit to get to the stadium, or to use the city's existing 32,000 parking spaces that are within a 20-minute walk. The stadium has only 200 parking spaces, which are designated for the players. Another major stadium by HKS is now under construction in Los Angeles and will house the LA Rams football team. The design calls for a giant, sculptural roof made of perforated metal and ETFE. The stadium will total nearly three million square feet (278,700 square metres).